If you are looking for gentle and effective chiropractic care without any twisting, "popping," or "cracking," then the ProAdjuster may be right for you! In her chiropractic practice, Dr. Kane uses the ProAdjuster, a painless way to achieve great and long-lasting results. When improper spinal motion affects how your nerves function, it is called a subluxation. Traditionally, a chiropractor will press on your spine to check for joint motion. The ProAdjuster can gently determine precise levels of motion and isolate a problem area faster and more accurately than manual procedures, while you're in a comfortable seated position. Have you ever flinched when someone feels your spine or muscles? The sensor in the ProAdjuster instrument analyzes motion faster than your body can react, so there is no flinching. Dr. Kane then uses the information from the computerized analysis to decide which joints to adjust. The spinal adjustment is also done while you're in a comfortable seated position, and the ProAdjuster will improve joint motion by tapping repeatedly until the sensor relays information that the joint is no longer "stuck." It is gentle and painless, so there is no flinching response. The pressure can be set so that it is light enough for a small child or strong enough for a professional football player. Can Chiropractic Help Relieve Your Pain? Chiropractors focus on the relationship between the spine and nervous system and how that relationship affects the restoration and preservation of health. The ability of chiropractic to help you achieve true health begins with a simple concept. The nervous system (the brain and all the nerves) controls every function in your body. If there is interference in this network, dysfunction and pain can occur, resulting in sickness and diminished overall health. Chiropractic is known for treating back and neck pain, but it's also used to treat a range of problems such as chronic pain, headaches, migraines, carpal tunnel, muscle strain or pain from an injury, and so much more. In fact, you can maximize your health and performance by improving the health of your nervous system. The best way to do this is to have Dr. Kane use the ProAdjuster to analyze and adjust your spine to improve the functioning of your nervous system. Dr. Kane evaluates each patient as a whole during the examination and treats each individual's healthy alignment rather than just focusing on one symptom or specific part of the body. She will recommend treatments based on your health and wellness needs and goals. Your treatment is always individualized, just like you! Getting adjusted with the ProAdjuster doesn't hurt at all. In fact, most patients find it very relaxing and notice an immediate improvement in their area of pain and in their range of motion. Dr. Kane chooses the amount of pressure that is applied based on the area of the spine being adjusted, the size of the patient, and the sensitivity of the area being adjusted. It can be gentle enough to use on a small child or strong enough to use on a professional football player. Plus, there is no twisting, "popping," or "cracking" required! Can I get the benefits of chiropractic without any twisting, popping, or cracking? Absolutely! 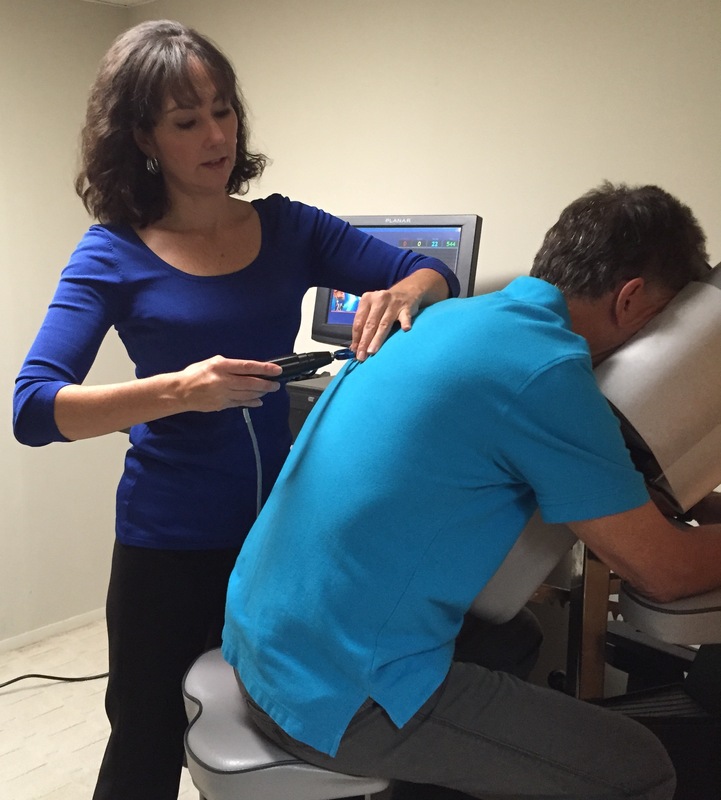 Dr. Kane primarily uses the ProAdjuster when adjusting patients. While you are comfortably leaning forward in a specially designed chair, Dr. Kane will gently tap the ProAdjuster instrument against the joints in your spine to obtain an objective measurement of spinal motion. She will use the information from the computerized analysis of motion to determine which joints to adjust, and then use the ProAdjuster instrument to tap the vertebral joint repetitively until the piezoelectric sensor reflects that the joint motion has improved. The force applied will depend on the area of the body, the size of the patient, and the patient's sensitivity. Most patients can't believe how good the adjustment feels - and how good they feel afterwards! The ProAdjuster measures precise levels of motion in the joints of the spine. Dr. Kane will press the ProAdjuster instrument against the spine to introduce a light force into the vertebra, which is reflected back to the piezoelectric sensor in the instrument. The computer will interpret the reflective force from the piezoelectric sensor, all before the body can react. Dr. Kane can then use the information on the computer to help determine which joints should be adjusted. When adjusting, the ProAdjuster uses a precise oscillating force with uninterrupted motion. It can increase the mobility of the spinal segments by reducing or enabling motion in abnormal areas. In other words, the ProAdjuster is "unsticking" the joint. Have you ever seen a woodpecker tapping in an oscillating fashion on a tree? It is hard to believe, but you can watch them bore right through wood. The ProAdjuster instrument taps in much the same way but uses soft tips that are comfortable to the human body and do not create damage. This is the same technology and same type of instrument that NASA engineers have used in the space shuttle program to evaluate the integrity of the ceramic cooling tiles on the outside of the space shuttle. The aviation industry, as well as civil engineers, have used this technology to test metal fatigue in aircraft and bridge spans. Chiropractors are now able to use this highly sophisticated technology to determine proper motion. You can have the same level of care given to your body as a multi-million dollar spacecraft. Doesn't that give you a higher level of confidence? Although many people associate chiropractic care with low back pain, chiropractic is effective in helping a variety of neuromusculoskeletal complaints. Neck pain, headaches, mid and low back pain, sciatica, knee pain, plantar fasciitis, shoulder pain, elbow pain, carpal tunnel syndrome, TMJ disorders, and more can be helped with chiropractic care. Chiropractors are experts at analyzing the structure of the body, and since structure affects function, overall health can be impacted through chiropractic care. The number of adjustments that you will need depends on the severity of your condition and how long you've had it. Dr. Kane's goal is to get you feeling good and functioning well as quickly as possible. She will recommend a treatment plan based on your complaint, the examination findings, and your healthcare goals, but your care is always up to you! A Holistic Approach to Health Awaits You. (Regarding Hypnosis) "Just broke into the next "decade" down on the scale today. Was aiming for it. Took a skirt back to seamstress yesterday - it was way too big. I was very pleased last weekend when we had company I didn't pull out all my old fav recipes to indulge like a crazy woman and make them do the same. We did healthy smoothies, light lunches, etc. I didn't sabotage myself or them. Now THAT is a breakthrough. Again, the one word that I feel separates this experience from all the other times, is a sense of calm and peace and being kind to myself. I don't seem to badger myself with trying to be perfect. Thanks again for your tips and expertise." I went to Dr. Kane last week for hypnosis to help with my snacking and over-eating problems. It's amazing how much it has helped! It really works. Yes, I have been tempted to snack, but she gave me cues to help me overcome that old habit! Fantastic!